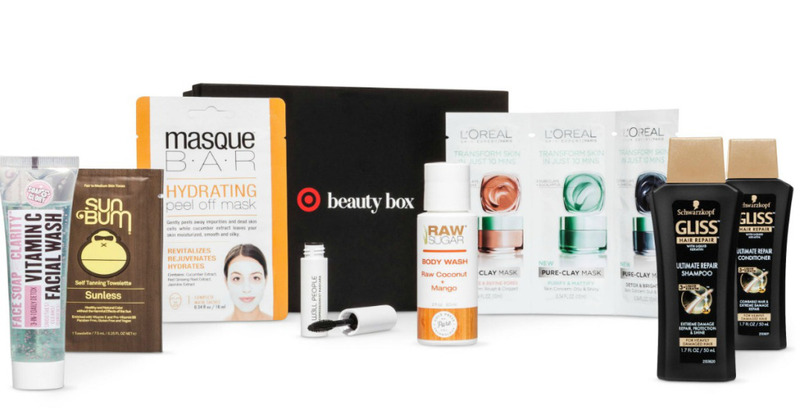 Head over to Target.com where you can grab up the new February Beauty Box! This beauty box is available for just $10 shipped ($38 value).. Note that there is a limit of one beauty box per person. A skin-moisturizing sheet mask that gently removes impurities and dead skin cells as it hydrates and soothes your skin with cucumber extract, aloe, collagen and vitamin E.
Gently brightens and soothes your skin while locking in all the good oils, vitamins and enzymes that skin needs to look and feel amazing. It smells delicious, too. A non-drying, easy-rinse formula that smoothes and purifies your skin, leaving it super clean, fresh and bright. Made with superfruit yuzu and ultra-soft scrub beads. Infuses your hair with keratin to repair, strengthen and restore damaged hair from the inside out, preventing future breakage and leaving hair shiny and smooth. An easy-to-use, clear formula for the face and body that exfoliates, moisturizes and works with the proteins and amino acids in your skin to produce a natural sunless tan. Creates bold, nourished lashes with pure mineral pigments and a botanical blend. A unique brush lengthens each lash and delivers just the right amount of product, preventing clumps. A super-charged, pure clay mask that removes impurities and soothes your skin in just 10 minutes using natural ingredients for a spa-like experience.